No one was happier than yours truly when Daniel Boulud decided to return to Las Vegas — after a four year hiatus. And return he has, with a top toque in the kitchen, and you won’t find better, unfussy French food in town right now. Regardless, the feng shui is in all the right places (even if the joint would have more charm at half its size), and you will feel right at home as soon as you are seated. The lighting is flattering to the food and the customer — bright but not too so — and the tables are set with tablecloths (hooray for civilized dining!) and eye to the diner’s comfort, not how much money they can save with disgusting, reusable placemats. What they and the rest of the menu announce is that this restaurant is basically all over the (French) map. So, expect to find an ethereal lemon-saffron-seafood-draped linguine du sud:….nicely echoing the light and lemony flavors of Provence, side by side with a spicy Tunisian lamb (presented as a luscious chop ringed with a house-made Merguez sausage), or a fabulous duck confit, or crispy-skin, roast chicken….all of which could be straight from a French farmhouse. Executive Chef David Middleton has major chops — having cut his teeth with Alex Stratta at the defunct Alex — and he’s equally at home whipping up a classic beef Bourguignon as he is a country pate or a omelet aux fine herbes. Everything (including a superior steak frites) show a kitchen with great attention to detail (a Boulud trademark). What they also show is something new in these here parts: a move away from strictly à la carte dining — as each of the entrees (save the pasta) is presented as a finished plate of food — complete with vegetables sauces and sides attached. In other words, your $48 12 oz. New York strip comes with a sauce and haricot verts — with no need to pay separately for the accoutrements — definitely a bargain compared to what many a top end steakhouse gouges you for…if you want anything but a bare piece of meat on your plate. If that isn’t bargin enough for you, the two, three-course prix fixe menus: $32/lunch; $48/dinner, are a criminally cheap for vittles this good. ….of which we defy you to eat just one. Max Jacobson (who hasn’t been well enough to review this place, but dollars-to-doughnuts, this is what he would say): Once again, Curtas’s Freudian French slip is showing. But in spite of his slavish devotion to Francophilia, occasionally he has a point. The cooking here is solid, if unspectacular, and would appeal to me a lot more if Boulud and Middleton incorporated more Uzbekistani notes and yak milk into their cuisine. Recommended dishes: Salmon Rillettes; Carrot Salad; Mediterranean Lamb Flatbread; Short Rib Tagliatelle; Tarte Flambee; French Onion Soup; Pate de Campagne; Terrine of Foie Gras; Escargots Spatzle; Smoked Salmon; Liguine de Sud; Roasted Chicken; Duck Confit; Tunisian Lamb; Basically everything on the friggin’ menu + the omelet aux fine herbs (which is off it). I can only assume that your service was better than ours; having been to each of Boulud’s NYC restaurants I was more than a little disappointed by how they mailed our meal in. Hard to believe that we were at DBB the same night as you. We had terrible service, mediocre food, and I hate what they have done with the space. We are big fans of Daniel and the Moderne, and had really enjoyed DBB @ Wynn, so we were looking forward to the experience here. #19 on your list, making it the best French Brasserie in town…I think not! Bouchon, and Mon Ami Gabi, are both better. 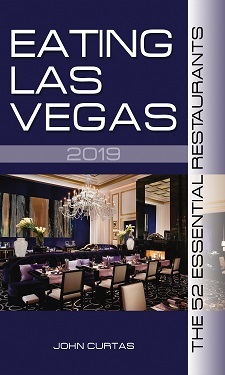 ELV responds: While we concur that db Brasserie is not on the same level as Daniel, Cafe Boulud, DB Moderne, or even Bar Boulud, our four visits here found the cooking to be far superior to the by-the-numbers cuisine of Mon Ami Gabi, and more intense than that of Bouchon. Fred K. is a well-traveled and sophisticated gastronaut, and we value his opinion and always love to hear from him, but on this one we will simply have to agree to disagree. I would have agreed with you during the soft opening, but they changed many recipes at the official opening, and most of the items are no longer memorable. Except the pâté – it still is one of the best dishes in town. Tried them when they opened, beginning of July and then in August. Truly disappointing food AND service. This restaurant needs an injection of DB JC or he’ll have another restaurant in Las Vegas DOA. Swordfish is in the picture on the website menu, but no longer on the menu? That was the one thing I wanted to eat there. I’ve had a fair amount of DB’s food but with no swordfish on its menu, I’m unlikely to visit his latest Vegas incarnation. Trouble is brewing here. Service was a dumpster fire and the food was bland and boring. Not the DB I know and love. John, you may want to revisit and see what’s going on.